A deeply divided Washington State Supreme Court ruled today that De-Escalate Washington’s Initiative 940 must appear on the November 2018 ballot to be considered by the people because its adoption by the Legislature last winter was effectively not without change or amendment due to the Legislature’s passage of a separate compromise bill (ESHB 3003) intended to supersede I-940. I-940 is an effort to change the standard of accountability for use of deadly force. The standard currently in statute requires prosecutors to prove that a law enforcement officer acted “without malice”, which is almost impossible to prove. During the 2018 session, legislative leaders worked with both the De-Escalate Washington coalition and representatives from law enforcement groups to perfect the initiative with a successor bill so it wouldn’t have to go to the ballot. Nice try, but sorry, I-940 has to go to the ballot, the Supreme Court said, bringing to an end a legal challenge to the I-940 compromise initiated by Tim Eyman. The opinions filed in this case are a challenging read due to the justices’ sharply differing views and will become interesting fodder for constitutional law classes. Justice Sheryl Gordon McCloud wrote both for herself as well as for Justices Charlie Wiggins, Steven Gonzalez, and Mary Yu. As stated in the concluding except above, Justice McCloud’s party would have invalidated just the successor bill and left I-940 alone, but they were one shy of a majority. Justice Yu wrote a concurring opinion expressing her dissatisfaction with the end result and the Court’s placement of I-940 on the ballot. Justice Barbara Madsen authored an opinion concurring with Justice McCloud’s party to the extent that ESHB 3003 effectively amended I-940, but disagreeing with McCloud’s party that the appropriate remedy was to strike only the successor bill and leave the original initiative standing. Justice Debra Stephens authored a dissenting opinion joined by Justices Susan Owens and Charles Johnson reasoning that both I-940 and ESHB 3003 were validly approved by the Legislature during the 2018 session, but that since ESHB 3003 constitutes an alternative to Initiative 940, it must be put on the ballot along with the original initiative for the people to consider. Justice Mary Fairhurst authored a shorter dissenting opinion that argues for the same remedy, or outcome, as Justice Stephens’ dissent. Not since the Andersen decision was handed down can I recall the Supreme Court splitting every which way like this in such a high profile case. NPI shares Justice Yu’s unease about the precedent this verdict sets. It is the province of the judiciary to say what the law is, but with this decision, the Supreme Court is veering outside of its realm. It has done more than interpret the law. De-Escalate Washington expressed its disappointment with the Court’s decision in a statement sent to the Northwest Progressive Institute. “The work we did with law enforcement to reach a consensus agreement on police reform was tough, honest, and groundbreaking, and we are disappointed that the Court took the position it did,” said Tim Reynon, co-chair of De-Escalate Washington and a Puyallup Tribe of Indians Councilmember. 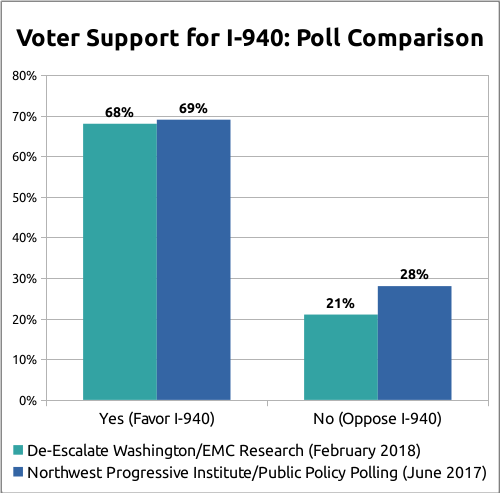 Although unhappy with the outcome of Tim Eyman’s legal challenge to I-940, he coalition says it is nevertheless prepared to mount a strong campaign in favor of I-940 this autumn. Research by both the coalition and by NPI suggests the measure will be overwhelmingly popular with Washingtonians. Our polling and De-Escalate Washington’s polling were conducted months apart and by different firms, but the resulting numbers were very similar. Both polls found an almost identical level of support for the measure, while our survey found slightly higher opposition to the measure than the coalition did. I-940’s addition to the ballot by the Supreme Court means that there will be a total of four initiatives before Washington voters this November.